The Ramp Up program began in Kalamazoo County in 2004 resulting in greater freedom and independence for the people receiving ramps. Ramp Up changes lives and can result in people not having to enter a nursing facility. 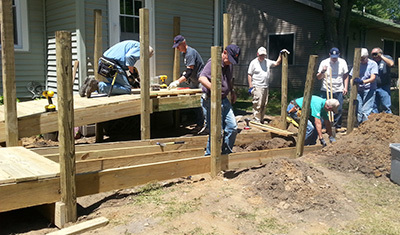 The Ramp Up program is made up of volunteer builders from our church, Haven Reformed Church, Centerpoint Church, Westwood Reformed Church, and Red Arrow Ministries. We also collaborate with Harbor Habitat for Humanity and Battle Creek Area Habitat for Humanity. Ramp Up is funded in part by the United Way of the Battle Creek & Kalamazoo Region, the Van Buren County United Way, St. Joseph/Benton Harbor Rotary, Battle Creek Community Foundation and private donations.